The present invention relates to new crystalline molecular sieve SSZ-65 prepared using 1-[1-(4-chlorophenyl)-cyclopropylmethyl]-1-ethyl-pyrrolidinium or 1-ethyl-1-(1-phenyl-cyclopropylmethyl)-pyrrolidinium cation as a structure-directing agent, methods for synthesizing SSZ-65 and processes employing SSZ-65 in a catalyst. The present invention further includes a process for producing a C 20+ lube oil from a C20+ olefin feed comprising isomerizing said olefin feed under isomerization conditions over a catalyst comprising the zeolite of this invention. The zeolite may be predominantly in the hydrogen form. The catalyst may contain at least one Group VIII metal. This invention further provides an isomerization process for isomerizing C 4 to C7 hydrocarbons, comprising contacting a feed having normal and slightly branched C4 to C7 hydrocarbons under isomerizing conditions with a catalyst comprising the zeolite of this invention, preferably predominantly in the hydrogen form. The zeolite may be impregnated with at least one Group VIII metal, preferably platinum. The catalyst may be calcined in a steam/air mixture at an elevated temperature after impregnation of the Group VIII metal. Also provided by the present invention is a process for alkylating an aromatic hydrocarbon which comprises contacting under alkylation conditions at least a molar excess of an aromatic hydrocarbon with a C 2 to C20 olefin under at least partial liquid phase conditions and in the presence of a catalyst comprising the zeolite of this invention, preferably predominantly in the hydrogen form. The olefin may be a C2 to C4 olefin, and the aromatic hydrocarbon and olefin may be present in a molar ratio of about 4:1 to about 20:1, respectively. The aromatic hydrocarbon may be selected from the group consisting of benzene, toluene, ethylbenzene, xylene, naphthalene, naphthalene derivatives, dimethylnaphthalene or mixtures thereof. Further provided in accordance with this invention is a process for isomerizing an isomerization feed comprising an aromatic C 8 stream of xylene isomers or mixtures of xylene isomers and ethylbenzene, wherein a more nearly equilibrium ratio of ortho-, meta- and para-xylenes is obtained, said process comprising contacting said feed under isomerization conditions with a catalyst comprising the zeolite of this invention. (b) withdrawing from said reaction zone a higher molecular weight hydrocarbon-containing stream. The SDA cation is associated with an anion (X −) which may be any anion that is not detrimental to the formation of the zeolite. Representative anions include halogen, e.g., fluoride, chloride, bromide and iodide, hydroxide, acetate, sulfate, tetrafluoroborate, carboxylate, and the like. Hydroxide is the most preferred anion. Typical sources of aluminum oxide for the reaction mixture include aluminates, alumina, aluminum colloids, aluminum oxide coated on silica sol, hydrated alumina gels such as Al(OH) 3 and aluminum compounds such as AlCl3 and Al2(SO4)3. Typical sources of silicon oxide include silicates, silica hydrogel, silicic acid, fumed silica, colloidal silica, tetra-alkyl orthosilicates, and silica hydroxides. Boron, as well as gallium, germanium, titanium, indium, vanadium and iron, can be added in forms corresponding to their aluminum and silicon counterparts. SSZ-65 can be made with a mole ratio of YO 2/WcOd of ∞, i.e., there is essentially no WcOd present in the SSZ-65. In this case, the SSZ-65 would be an all-silica material or a germanosilicate. Thus, in a typical case where oxides of silicon and aluminum are used, SSZ-65 can be made essentially aluminum free, i.e., having a silica to alumina mole ratio of ∞. A method of increasing the mole ratio of silica to alumina is by using standard acid leaching or chelating treatments. However, essentially aluminum-free SSZ-65 can be synthesized using essentially aluminum-free silicon sources as the main tetrahedral metal oxide component, if boron is also present. The boron can then be removed, if desired, by treating the borosilicate SSZ-65 with acetic acid at elevated temperature (as described in Jones et al., Chem. Mater., 2001, 13, 1041-1050) to produce an all-silica version of SSZ-65. SSZ-65 can also be prepared directly as a borosilicate. If desired, the boron can be removed as described above and replaced with metal atoms by techniques known in the art to make, e.g., an aluminosilicate version of SSZ-65. SSZ-65 can also be prepared directly as an aluminosilicate. Representative peaks from the X-ray diffraction pattern of calcined SSZ-65 are shown in Table II. Calcination can also result in changes in the intensities of the peaks as compared to patterns of the “as-made” material, as well as minor shifts in the diffraction pattern. The molecular sieve produced by exchanging the metal or other cations present in the molecular sieve with various other cations (such as H + or NH4 +) yields essentially the same diffraction pattern, although again, there may be minor shifts in the interplanar spacing and variations in the relative intensities of the peaks. Notwithstanding these minor perturbations, the basic crystal lattice remains unchanged by these treatments. Lube oil may be prepared using SSZ-65. For example, a C 20+ lube oil may be made by isomerizing a C20+ olefin feed over a catalyst comprising SSZ-65 in the hydrogen form and at least one Group VIII metal. Alternatively, the lubricating oil may be made by hydro cracking in a hydro cracking zone a hydrocarbonaceous feedstock to obtain an effluent comprising a hydrocracked oil, and catalytically dewaxing the effluent at a temperature of at least about 400° F. (204° C.) and at a pressure of from about 15 psig to about 3000 psig (0.103-20.7 MPa gauge) in the presence of added hydrogen gas with a catalyst comprising SSZ-65 in the hydrogen form and at least one Group VIII metal. The present catalyst is highly active and highly selective for isomerizing C 4 to C7 hydrocarbons. The activity means that the catalyst can operate at relatively low temperature which thermodynamically favors highly branched paraffins. Consequently, the catalyst can produce a high octane product. The high selectivity means that a relatively high liquid yield can be achieved when the catalyst is run at a high octane. The present process comprises contacting the isomerization catalyst, i.e., a catalyst comprising SSZ-65 in the hydrogen form, with a hydrocarbon feed under isomerization conditions. The feed is preferably a light straight run fraction, boiling within the range of 30° 0 F. to 250° F. (−1° C. to 121° C.) and preferably from 60° F. to 200° F. (16° C. to 93° C.). Preferably, the hydrocarbon feed for the process comprises a substantial amount of C4 to C7 normal and slightly branched low octane hydrocarbons, more preferably C5 and C6 hydrocarbons. It is preferable to carry out the isomerization reaction in the presence of hydrogen. Preferably, hydrogen is added to give a hydrogen to hydrocarbon ratio (H 2/HC) of between 0.5 and 10 H2/HC, more preferably between 1 and 8 H2/HC. See the aforementioned U.S. Pat. Nos. 4,910,006 and 5,316,753 for a further discussion of isomerization process conditions. SSZ-65 can be used in a process for the alkylation or transalkylation of an aromatic hydrocarbon. The process comprises contacting the aromatic hydrocarbon with a C 2 to C16 olefin alkylating agent or a polyalkyl aromatic hydrocarbon transalkylating agent, under at least partial liquid phase conditions, and in the presence of a catalyst comprising SSZ-65. SSZ-65 can be used to convert light gas C 2-C6 paraffins to higher molecular weight hydrocarbons including aromatic compounds. Preferably, the zeolite will contain a catalyst metal or metal oxide wherein said metal is selected from the group consisting of Groups IB, IIB, VIII and IIIA of the Periodic Table. Preferably, the metal is gallium, niobium, indium or zinc in the range of from about 0.05 to 5% by weight. SSZ-65 can be used to isomerize olefins. The feed stream is a hydrocarbon stream containing at least one C 4-6 olefin, preferably a C4-6 normal olefin, more preferably normal butene. Normal butene as used in this specification means all forms of normal butene, e.g., 1-butene, cis-2-butene, and trans-2-butene. Typically, hydrocarbons other than normal butene or other C4-6 normal olefins will be present in the feed stream. These other hydrocarbons may include, e.g., alkanes, other olefins, aromatics, hydrogen, and inert gases. The liquid hourly space velocity during contacting is generally from about 0.1 to about 50 hr −1, based on the hydrocarbon feed, preferably from about 0.1 to about 20 hr−1, more preferably from about 0.2 to about 10 hr−1, most preferably from about 1 to about 5 hr−1. A hydrogen/hydrocarbon molar ratio is maintained from about 0 to about 30 or higher. The hydrogen can be added directly to the feed stream or directly to the isomerization zone. The reaction is preferably substantially free of water, typically less than about two weight percent based on the feed. The process can be carried out in a packed bed reactor, a fixed bed, fluidized bed reactor, or a moving bed reactor. The bed of the catalyst can move upward or downward. The mole percent conversion of, e.g., normal butene to iso-butene is at least 10, preferably at least 25, and more preferably at least 35. SSZ-65 may also be useful in a process for isomerizing one or more xylene isomers in a C 8 aromatic feed to obtain ortho-, meta-, and para-xylene in a ratio approaching the equilibrium value. In particular, xylene isomerization is used in conjunction with a separate process to manufacture para-xylene. For example, a portion of the para-xylene in a mixed C8 aromatics stream may be recovered by crystallization and centrifugation. The mother liquor from the crystallizer is then reacted under xylene isomerization conditions to restore ortho-, meta- and para-xylenes to a near equilibrium ratio. At the same time, part of the ethylbenzene in the mother liquor is converted to xylenes or to products which are easily separated by filtration. The isomerate is blended with fresh feed and the combined stream is distilled to remove heavy and light by-products. The resultant C8 aromatics stream is then sent to the crystallizer to repeat the cycle. Higher molecular weight hydrocarbons can be formed from lower molecular weight hydrocarbons by contacting the lower molecular weight hydrocarbon with a catalyst comprising SSZ-65 and a metal or metal compound capable of converting the lower molecular weight hydrocarbon to a higher molecular weight hydrocarbon. Examples of such reactions include the conversion of methane to C 2+ hydrocarbons such as ethylene or benzene or both. Examples of useful metals and metal compounds include lanthanide and or actinide metals or metal compounds. 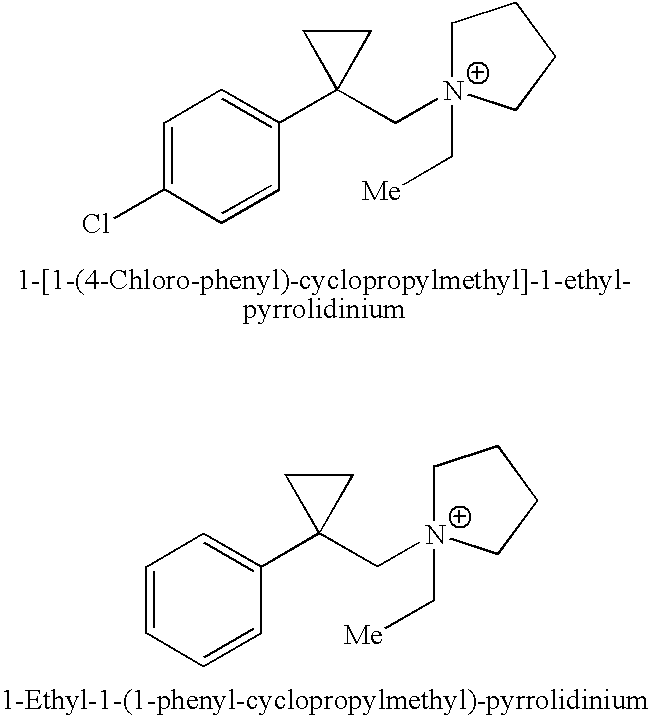 1-[1-(4-chloro-phenyl)-cyclopropylmethyl]-1-ethyl-pyrrolidinium iodide is prepared from the reaction of the parent amine 1-[1-(4-chloro-phenyl)-cyclopropylmethyl]-pyrrolidine with ethyl iodide. A 100 gm (0.42 mole) of the amine, 1-[1-(4-chloro-phenyl)-cyclopropylmethyl]-pyrrolidine, is dissolved in 1000 ml anhydrous methanol in a 3-litre 3-necked reaction flask (equipped with a mechanical stirrer and a reflux condenser). To this solution, 98 gm (0.62 mole) of ethyl iodide is added, and the mixture is stirred at room temperature for 72 hours. Then, 39 gm (0.25 mol.) of ethyl iodide is added and the mixture is heated at reflux for 3 hours. The reaction mixture is cooled down and excess ethyl iodide and the solvent are removed at reduced pressure on a rotary evaporator. The obtained dark tan-colored solids (162 gm) are further purified by dissolving in acetone (500 ml) followed by precipitation by adding diethyl ether. Filtration and air-drying the obtained solids gives 153 gm (93% yield) of the desired 1-[1-(4-chloro-phenyl)-cyclopropylmethyl]-1-ethyl-pyrrolidinium iodide as a white powder. The product is pure by  1H and 13C-NMR analysis. 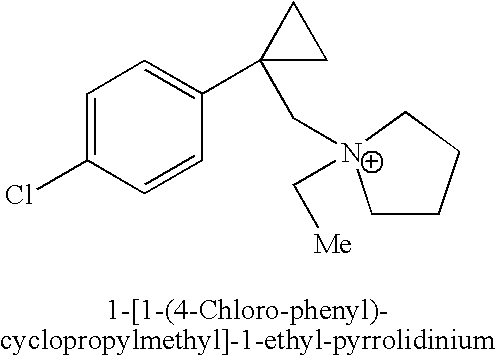 The parent amine 1-[1-(4-chloro-phenyl)-cyclopropylmethyl]-pyrrolidine is obtained from the LiAlH 4-reduction of the precursor amide [1-(4-chloro-phenyl)-cyclopropyl]-pyrrolidin-1-yl-methanone. In a 3-neck 3-liter reaction flask equipped with a mechanical stirrer and reflux condenser, 45.5 gm (1.2 mol.) of LiAlH4 is suspended in 750 ml anhydrous tetrahydrofuran (THF). The suspension is cooled down to 0° C. (ice-bath), and 120 gm (0.48 mole) of [1-(4-chloro-phenyl)-cyclopropyl]-pyrrolidin-1-yl-methanone dissolved in 250 ml THF is added (to the suspension) drop-wise via an addition funnel. Once all the amide solution is added, the ice-bath is replaced with a heating mantle and the reaction mixture is heated at reflux overnight. Then, the reaction solution is cooled down to 0° C. (the heating mantle was replaced with an ice-bath), and the mixture is diluted with 500 ml diethyl ether. The reaction is worked up by adding 160 ml of 15% wt. of an aqueous NaOH solution drop-wise (via an addition funnel) with vigorous stirring. The starting gray reaction solution changes to a colorless liquid with a white powdery precipitate. The solution mixture is filtered and the filtrate is dried over anhydrous magnesium sulfate. Filtration and concentration of the filtrate gives 106 gm (94% yield) of the desired amine 1-[1-(4-chloro-phenyl)-cyclopropylmethyl]-pyrrolidine as a pale yellow oily substance. The amine is pure as indicated by the clean 1H and 13C-NMR spectral analysis. The 1-(4-chloro-phenyl)-cyclopropanecarbonyl chloride used in the synthesis of the amide is synthesized by treatment of the parent acid 1-(4-chloro-phenyl)-cyclopropanecarboxylic acid with thionyl chloride (SOCl 2) as described below. To 200 gms of thionyl chloride and 200 ml dichloromethane in a 3-necked reaction flask, equipped with a mechanical stirrer and a reflux condenser, 100 gm (0.51 mol.) of the 1-(4-chloro-phenyl)-cyclopropanecarboxylic acid is added in small increments (5 gm at a time) over 15 minutes period. Once all the acid is added, the reaction mixture is then heated at reflux. The reaction vessel is equipped with a trap (filled with water) to collect and trap the acidic gaseous byproducts, and used in monitoring the reaction. The reaction is usually done once the evolution of the gaseous byproducts is ceased. The reaction mixture is then cooled down and concentrated on a rotary evaporator at reduced pressure to remove excess thionyl chloride and dichloromethane. The reaction yields 109 gm (98%) of the desired 1-(4-chloro-phenyl)-cyclopropanecarbonyl chloride as reddish viscous oil. A 23 cc Teflon liner is charged with 5.4 gm of 0.6M aqueous solution of 1-ethyl-1-(1-phenyl-cyclopropylmethyl)-pyrrolidinium hydroxide (3 mmol SDA), 1.2 gm of 1 M aqueous solution of NaOH (1.2 mmol NaOH) and 5.4 gm of de-ionized water. To this mixture, 0.06 gm of sodium borate decahydrate (0.157 mmol of Na 2B4O7.10H2O; ˜0.315 mmol B2O3) is added and stirred until completely dissolved. Then, 0.9 gm of CAB-O-SIL® M-5 fumed silica (˜14.7 mmol SiO2) is added to the solution and the mixture is thoroughly stirred. The resulting gel is capped off and placed in a Parr bomb steel reactor and heated in an oven at 160° C. while rotating at 43 rpm. The reaction is monitored by checking the gel's pH, and by looking for crystal formation using Scanning Electron Microscopy (SEM). The reaction is usually complete after heating 9-12 days at the conditions described above. Once the crystallization is completed, the starting reaction gel turns to a mixture comprised of a clear liquid and powdery precipitate. The mixture is filtered through a fritted-glass funnel. The collected solids are thoroughly washed with water and, then, rinsed with acetone (10 ml) to remove any organic residues. The solids are allowed to air-dry overnight and, then, dried in an oven at 120° C. for 1 hour. The reaction affords 0.85 gram of a very fine powder. SEM shows the presence of only one crystalline phase. The product is determined by powder XRD data analysis to be SSZ-65. A 23 cc Teflon liner is charged with 4 gm of 0.6M aqueous solution of 1-ethyl-1-(1-phenyl-cyclopropylmethyl)-pyrrolidinium hydroxide (2.25 mmol SDA), 1.5 gm of 1 M aqueous solution of NaOH (1.5 mmol NaOH) and 2 gm of de-ionized water. To this mixture, 0.25 gm of Na-Y zeolite (Union Carbide's LZY-52; SiO 2/Al2O3=5) is added and stirred until completely dissolved. Then, 0.85 gm of CAB-O-SIL® M-5 fumed silica (˜14. mmol SiO2) is added to the solution and the mixture is thoroughly stirred. The resulting gel is capped off and placed in a Parr bomb steel reactor and heated in an oven at 160° C. while rotating at 43 rpm. The reaction is monitored by checking the gel's pH (increase in the pH usually results from condensation of the silicate species during crystallization, and decrease in pH often indicates decomposition of the SDA), and by checking for crystal formation by scanning electron microscopy. The reaction is usually complete after heating for 12 days at the conditions described above. Once the crystallization is completed, the starting reaction gel turns to a mixture comprised of a liquid and powdery precipitate. The mixture is filtered through a fritted-glass funnel. The collected solids are thoroughly washed with water and, then, rinsed with acetone (10 ml) to remove any organic residues. The solids are allowed to air-dry overnight and, then, dried in an oven at 120° C. for 1 hour. The reaction affords 0.8 gram of SSZ-65. SSZ-65 is synthesized at varying SiO 2/B2O3 mole ratios in the starting synthesis gel. This is accomplished using the synthetic conditions described in Example 3 keeping everything the same while changing the SiO2/B2O3 mole ratios in the starting gel. This is done by keeping the amount of CAB-O-SIL® M-5 (98% SiO2 and 2% H2O) the same while varying the amount of sodium borate in each synthesis. Consequently, varying the amount of sodium borate leads to varying the SiO2/Na mole ratios in the starting gels. Table 1 below shows the results of a number of syntheses with varying SiO2/B2O3 in the starting synthesis gel. The calcined version of borosilicate SSZ-65 (as synthesized in Example 3 and calcined in Example 16) is easily converted to the aluminosilicate SSZ-65 version by suspending borosilicate SSZ-65 in 1M solution of aluminum nitrate nonahydrate (15 ml of 1M Al(NO 3)3.9H2O soln./1 gm SSZ-65). The suspension is heated at reflux overnight. The resulting mixture is then filtered and the collected solids are thoroughly rinsed with de-ionized water and air-dried overnight. The solids are further dried in an oven at 120° C. for 2 hours. The Na + form of SSZ-65 (prepared as in Example 3 or as in Example 5 and calcined as in Example 16) is converted to NH4 +-SSZ-65 form by heating the material in an aqueous solution of NH4NO3 (typically. 1 gm NH4NO3/1 gm SSZ-65 in 20 ml H2O) at 90° C. for 2-3 hours. The mixture is then filtered and the obtained NH4-exchanged-product is washed with de-ionized water and dried. The NH4 + form of SSZ-65 can be converted to the H+ form by calcination (as described in Example 16) to 540° C.
SSZ-65 has a micropore volume of 0.16 cc/gm based on argon adsorption isotherm at 87.5° K. (−186° C.) recorded on ASAP 2010 equipment from Micromerities. The sample is first degassed at 400° C. for 16 hours prior to argon adsorption. The low-pressure dose is 6.00 cm 3/g (STP). A maximum of one hour equilibration time per dose is used and the total run time is 35 hours. The argon adsorption isotherm is analyzed using the density function theory (DFT) formalism and parameters developed for activated carbon slits by Olivier (Porous Mater. 1995, 2, 9) using the Saito Foley adaptation of the Horvarth-Kawazoe formalism (Microporous Materials, 1995, 3, 531) and the conventional t-plot method (J. Catalysis, 1965, 4, 319). A 1 gm sample of SSZ-65 (prepared as in Example 3 and treated as in Examples 16, 17 and 18) is suspended in 10 gm de-ionized water. To this suspension, a solution of Pd(NH 3)4(NO3)2 at a concentration which would provide 0.5 wt. % Pd with respect to the dry weight of the molecular sieve sample is added. The pH of the solution is adjusted to pH of ˜9 by a drop-wise addition of dilute ammonium hydroxide solution. The mixture is then heated in an oven at 75° C. for 48 hours. The mixture is then filtered through a glass frit, washed with de-ionized water, and air-dried. The collected Pd-SSZ-65 sample is slowly calcined up to 482° C. in air and held there for three hours. 1. A process for converting hydrocarbons comprising contacting a hydrocarbonaceous feed at hydrocarbon converting conditions with a catalyst comprising a zeolite having a mole ratio greater than about 15 of (1) an oxide of a first tetravalent element to (2) an oxide of a trivalent element, pentavalent element, second tetravalent element which is different from said first tetravalent element or mixture thereof and having, after calcination, the X-ray diffraction lines of Table II. 2. The process of claim 1 wherein the zeolite is predominantly in the hydrogen form. 3. The process of claim 1 wherein the zeolite is substantially free of acidity. 4. The process of claim 1 wherein the process is a hydrocracking process comprising contacting the catalyst with a hydrocarbon feedstock under hydrocracking conditions. 5. The process of claim 4 wherein the zeolite is predominantly in the hydrogen form. 6. The process of claim 1 wherein the process is a dewaxing process comprising contacting the catalyst with a hydrocarbon feedstock under dewaxing conditions. 7. The process of claim 6 wherein the zeolite is predominantly in the hydrogen form. 8. The process of claim 1 wherein the process is a process for improving the viscosity index of a dewaxed product of waxy hydrocarbon feeds comprising contacting the catalyst with a waxy hydrocarbon feed under isomerization dewaxing conditions. 9. The process of claim 8 wherein the zeolite is predominantly in the hydrogen form. 10. The process of claim 1 wherein the process is a process for producing a C20+ lube oil from a C20+ olefin feed comprising isomerizing said olefin feed under isomerization conditions over the catalyst. 11. The process of claim 10 wherein the zeolite is predominantly in the hydrogen form. 12. The process of claim 10 wherein the catalyst further comprises at least one Group VIII metal. 13. The process of claim 1 wherein the process is a process for catalytically dewaxing a hydrocarbon oil feedstock boiling above about 350° F. (177° C.) and containing straight chain and slightly branched chain hydrocarbons comprising contacting said hydrocarbon oil feedstock in the presence of added hydrogen gas at a hydrogen pressure of about 15-3000 psi (0.103-20.7 MPa) under dewaxing conditions with the catalyst. 14. The process of claim 13 wherein the zeolite is predominantly in the hydrogen form. 15. The process of claim 13 wherein the catalyst further comprises at least one Group VIII metal. 16. The process of claim 13 wherein said catalyst comprises a layered catalyst comprising a first layer comprising the zeolite and at least one Group VIII metal, and a second layer comprising an aluminosilicate zeolite which is more shape selective than the zeolite of said first layer. catalytically dewaxing said effluent comprising hydrocracked oil at a temperature of at least about 400° F. (204° C.) and at a pressure of from about 15 psig to about 3000 psig (0.103 to 20.7 MPa gauge) in the presence of added hydrogen gas with the catalyst. 18. The process of claim 17 wherein the zeolite is predominantly in the hydrogen form. 19. The process of claim 17 wherein the catalyst further comprises at least one Group VIII metal. 20. The process of claim 1 wherein the process is a process for isomerization dewaxing a raffinate comprising contacting said raffinate in the presence of added hydrogen under isomerization dewaxing conditions with the catalyst. 21. The process of claim 20 wherein the zeolite is predominantly in the hydrogen form. 22. The process of claim 20 wherein the catalyst further comprises at least one Group VIII metal. 23. The process of claim 20 wherein the raffinate is bright stock. 24. The process of claim 1 wherein the process is a process for increasing the octane of a hydrocarbon feedstock to produce a product having an increased aromatics content comprising contacting a hydrocarbonaceous feedstock which comprises normal and slightly branched hydrocarbons having a boiling range above about 40° C. and less than about 200° C. under aromatic conversion conditions with the catalyst. 25. The process of claim 24 wherein the zeolite is substantially free of acid. 26. The process of claim 24 wherein the zeolite contains a Group VIII metal component. 27. The process of claim 1 wherein the process is a catalytic cracking process comprising contacting a hydrocarbon feedstock in a reaction zone under catalytic cracking conditions in the absence of added hydrogen with the catalyst. 28. The process of claim 27 wherein the zeolite is predominantly in the hydrogen form. 29. The process of claim 27 wherein the catalyst additionally comprises a large pore crystalline cracking component. 30. The process of claim 1 wherein the process is an isomerization process for isomerizing C4 to C7 hydrocarbons, comprising contacting a feed having normal and slightly branched C4 to C7 hydrocarbons under isomerizing conditions with the catalyst. 31. The process of claim 30 wherein the zeolite is predominantly in the hydrogen form. 32. The process of claim 30 wherein the zeolite has been impregnated with at least one Group VIII metal. 33. The process of claim 30 wherein the catalyst has been calcined in a steam/air mixture at an elevated temperature after impregnation of the Group VIII metal. 34. The process of claim 32 wherein the Group VIII metal is platinum. 35. The process of claim 1 wherein the process is a process for alkylating an aromatic hydrocarbon which comprises contacting under alkylation conditions at least a molar excess of an aromatic hydrocarbon with a C2 to C20 olefin under at least partial liquid phase conditions and in the presence of the catalyst. 36. The process of claim 35 wherein the zeolite is predominantly in the hydrogen form. 37. The process of claim 35 wherein the olefin is a C2 to C4 olefin. 38. The process of claim 37 wherein the aromatic hydrocarbon and olefin are present in a molar ratio of about 4:1 to about 20:1, respectively. 39. The process of claim 37 wherein the aromatic hydrocarbon is selected from the group consisting of benzene, toluene, ethylbenzene, xylene, naphthalene, naphthalene derivatives, dimethylnaphthalene or mixtures thereof. 40. The process of claim 1 wherein the process is a process for transalkylating an aromatic hydrocarbon which comprises contacting under transalkylating conditions an aromatic hydrocarbon with a polyalkyl aromatic hydrocarbon under at least partial liquid phase conditions and in the presence of the catalyst. 41. The process of claim 40 wherein the zeolite is predominantly in the hydrogen form. 42. The process of claim 40 wherein the aromatic hydrocarbon and the polyalkyl aromatic hydrocarbon are present in a molar ratio of from about 1:1 to about 25:1, respectively. 43. The process of claim 40 wherein the aromatic hydrocarbon is selected from the group consisting of benzene, toluene, ethylbenzene, xylene, or mixtures thereof. 44. The process of claim 40 wherein the polyalkyl aromatic hydrocarbon is a dialkylbenzene. 45. The process of claim 1 wherein the process is a process to convert paraffins to aromatics which comprises contacting paraffins under conditions which cause paraffins to convert to aromatics with a catalyst comprising the zeolite and gallium, zinc, or a compound of gallium or zinc. 46. The process of claim 1 wherein the process is a process for isomerizing olefins comprising contacting said olefin under conditions which cause isomerization of the olefin with the catalyst. 47. The process of claim 1 wherein the process is a process for isomerizing an isomerization feed comprising an aromatic C8 stream of xylene isomers or mixtures of xylene isomers and ethylbenzene, wherein a more nearly equilibrium ratio of ortho-, meta and para-xylenes is obtained, said process comprising contacting said feed under isomerization conditions with the catalyst. 48. The process of claim 1 wherein the process is a process for oligomerizing olefins comprising contacting an olefin feed under oligomerization conditions with the catalyst. 49. A process for converting oxygenated hydrocarbons comprising contacting said oxygenated hydrocarbon under conditions to produce liquid products with a catalyst comprising a zeolite having a mole ratio greater than about 15 of an oxide of a first tetravalent element to an oxide of a second tetravalent element which is different from said first tetravalent element, trivalent element, pentavalent element or mixture thereof and having, after calcination, the X-ray diffraction lines of Table II. 50. The process of claim 49 wherein the oxygenated hydrocarbon is a lower alcohol. 51. The process of claim 50 wherein the lower alcohol is methanol. 53. The process of claim 52 wherein the metal or metal compound comprises a lanthanide or actinide metal or metal compound. 54. The process of claim 52 wherein the lower molecular weight hydrocarbon is methane.